In 1981 Saturday Night Live, now turning 40, was on the verge of cancellation, not even having logged ten years on the air. The star-making variety program, during a notorious absence by producer/guiding light Lorne Michaels, had become stagnated with an unedifying cast and dismal sketches, and ratings plummeted accordingly. 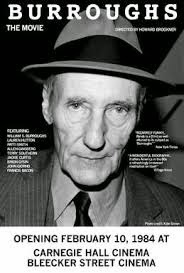 Yet the show, even in its low point, made literary history as the first TV program to broadcast an appearance by William S. Burroughs, the gaunt addict terrible of the Beat Generation. Burroughs was introduced by guest host Lauren Hutton as "America's greatest living writer," and he read, live from New York, from his hallucinatory Nova Express. That classic clip opens this 1983 documentary, which started as a short NYU film-school project by filmmaker Howard Brookner and stretched over the years (note future indie-cinema darlings Jim Jarmusch and Tom DiCillo listed as crew members). It was a period during which Burroughs went through methodone treatment and his own son Billy died of complications from cirrhosis of the liver, both mentioned along the way. Also included are wide-ranging interviews with Allen Ginsberg, Paul Bowles, Terry Southern and other cohorts now deceased. While readers of Naked Lunch or Junkie may be no less befuddled by the end, Burroughs stars here in casual fashion, living up to his legend of a character who went about as far to the edge as you can go. He relates one version (his former lover Ginsberg says there have been many) of circumstances under which he shot his wife Joan to death in 1951 in a druggy haze, an incident another commentator says kicked Burrough's literary creativity into high gear (I guess only a Beat intellectual would say something like that was a good move, artistic-wise). There are reminiscences about a St. Louis childhood with William's brother Mort (Bill demonstrates the "lost art" of toad-calling), claims about Burrough's early near-employment with the CIA (I presume he's not talking about the Cleveland Institute of Art. Then again...), and an extended bit of Burroughs trying out various firearms and hand-to-hand combat weapons. He hates violence, he says, but evidently abhorred homophobia even more. In a grand guignol operating-room skit Burroughs portrays his own famous prose creation, junkie physician Dr. Benway, and famous transvestite Jackie Curtis plays a nurse. Burroughs died in 1997, a hero figure to the last for everyone from Sting and Bono to Apple Computer guru Steve Jobs. Cult fans continue to prize this particular presentation.